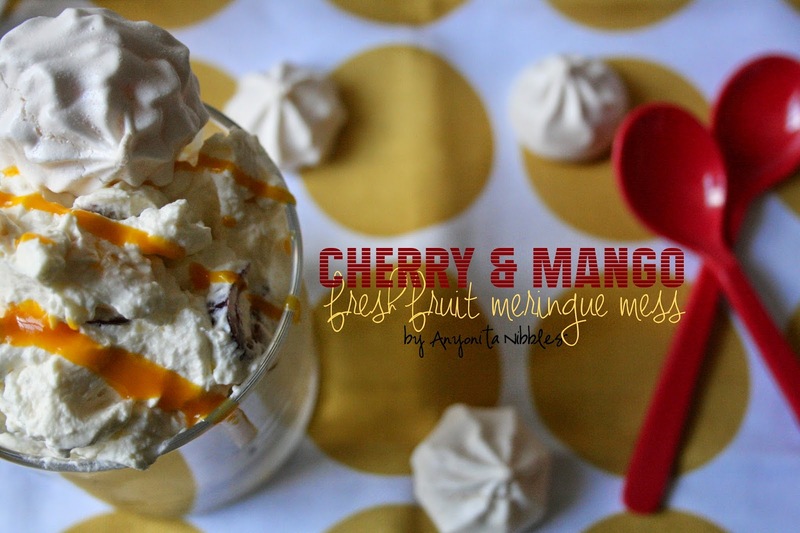 A gluten free summer dessert, made from fresh cherries, crushed meringue, freshly whipped cream & decadent mango coulis ! 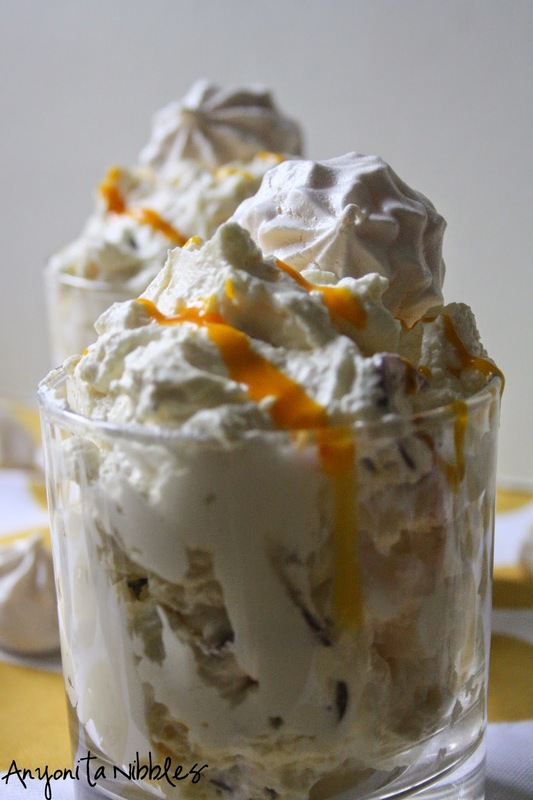 This is a dessert with all the undeniably delicious flavors of a tropical summer ... and it's got everything: that smooth velvety finish off perfectly whipped cream, the satisfying crunch of meringues, tart juicy cherries and sweet acidic mango. It's such an easy dessert to make, you can rustle one up during the day to serve with dinner tonight or you could dress it up and dish it into champagne flutes or martini glasses and serve it glam'd for a ritzy party. My American buddies may not have heard of an mess in this sense before, so let me explain. Here in the UK, there's a popular dessert named for a prestigious boy's school called, Eton Mess. It's pretty much what you see up there, just a lot simpler. A traditional Eton Mess is strawberries, cream and crushed meringue and it is riotously popular. My husband joked that I should name this dessert a Mancunian Mess (since it was created in our flat in Manchester). 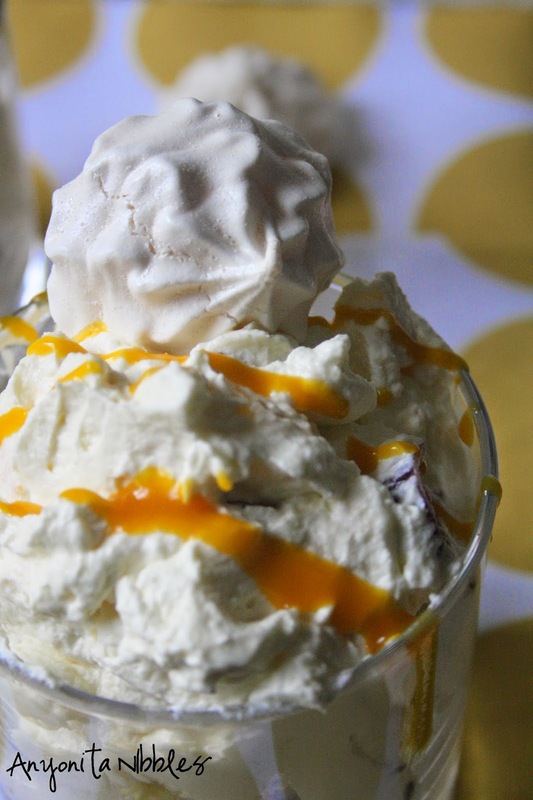 This cherry & mango meringue mess is my take on a classic. If you wanted to create your own, you can use any fruit you'd like; everything would work surprisingly well. This recipe will yield enough mess for 2 servings. You can easily increase the recipe. I chose not to sweeten my whipped cream because the meringues themselves are quite sugary and the fruit was very sweet. If you prefer sweeter cream, you can add 2 tablespoons caster sugar before you begin to whip. Preheat your oven to 110C/230F. Whisk the egg whites by hand or in the bowl of a stand mixer until they form soft peaks. Add the icing sugar and fold it in with a spatula until it is fully incorporated. Scoop the meringue mix into a piping bag and pipe onto a baking tray preferably lined with silicone, although baking paper works fine. Pipe any shapes you'd like, any size you'd like. The meringues will mostly be crushed, although leftover meringues make excellent cookies. Bake the meringues in the oven for about 75 minutes. 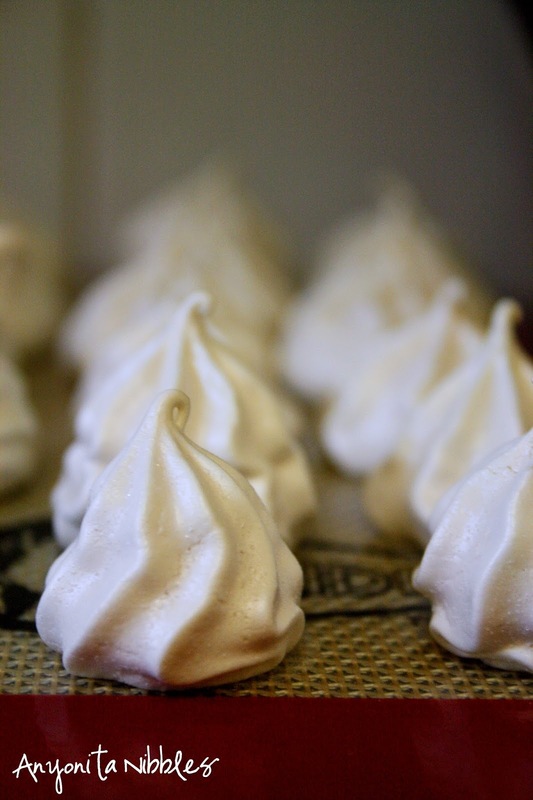 After 75 minutes, switch off the oven and leave the meringues inside until the oven cools completely. They should be crisp, but feel hollow when lifted. Pour the cream into a large bowl and whisk with a balloon whisk until thick and whipped. If you want to sweeten your cream, add in 2 tablespoons of caster sugar at the start. 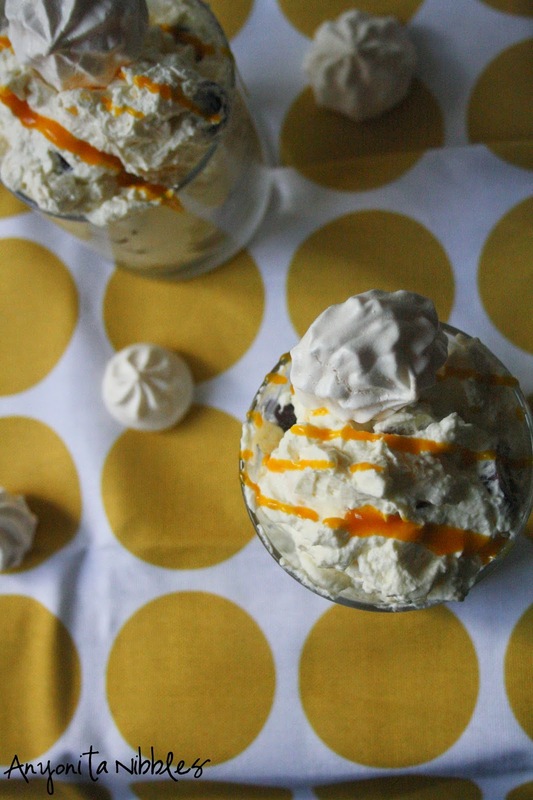 I always whip my cream by hand because it's easier to tell when it's at the right consistency, but you can whip yours in a stand mixer or using a hand mixer instead of a whisk. Wash, pit and halve the cherries. Fold the cherries into the whipped cream. Crumble some of the meringues into the cream and fold. 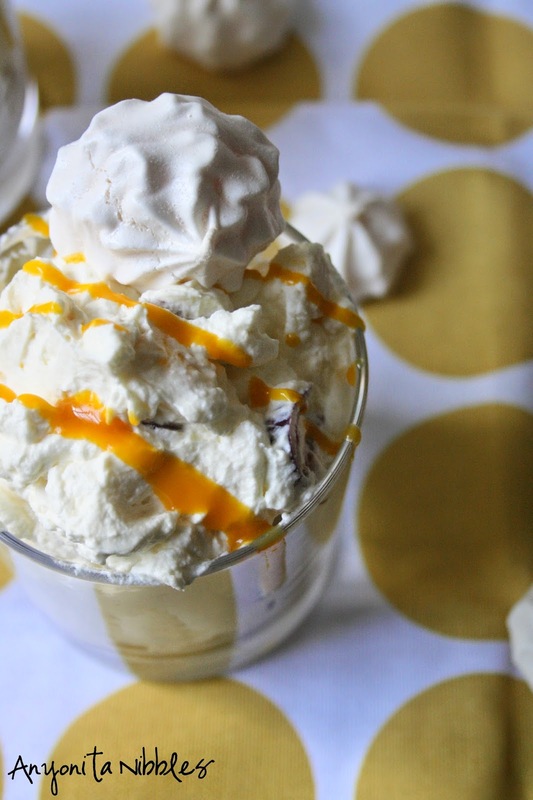 Scoop the cream into serving dishes, drizzle with mango coulis and top with a meringue. Oooh yum! 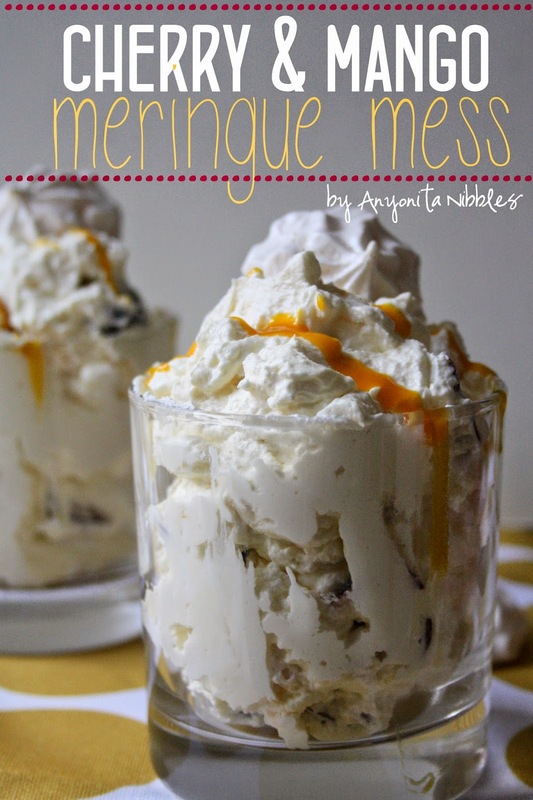 I love meringues, this preparation sounds great. :) Pinned! Thanks for explaining the origins of this recipe's name; I'm not always the neatest person and just assumed this would be tailor-made for someone like myself, somewhat of a messy guy in the kitchen :-) Either way, it looks fantastically delicious. Your work is so versatile and equally impressive; great job with this mess!! This sounds delicious! Thank you so much for linking up at Tasty Tuesday! Your recipe has been pinned to the Tasty Tuesday Pinterest board! Please join us again this week!